I hear a lot of that sort of comment! Your yarn looks nice, anyway! Thanks Leslie & Cyndy ..... I used vinegar and tartar. Would that make a difference in the resulting colour? Dawn, I'm not sure what you used but you can also use yellow onion skins, Queen Anne's lace, polk berries, walnut tree bark and lots of others. You've some really lovely yarn...good job! Yes, your mordant does make a difference in the final color. That's one way to "control" colors...use different mordants. 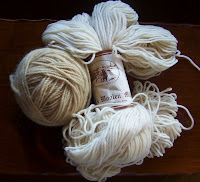 I know a woman who saved up copper pennies for a year and used those to soak wool yarn to get a soft green.